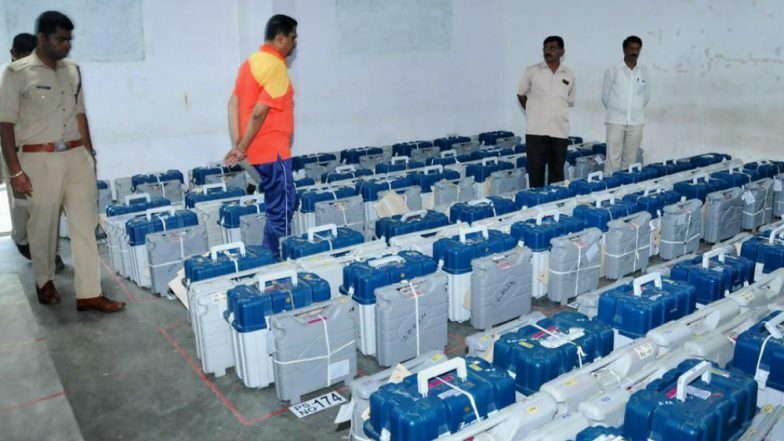 Hyderabad, April 15: A BJP candidate, who contested from the Nizamabad Lok Sabha constituency in the April 11 polls, Monday requested election authorities to allow him to put his own lock on strong rooms where the EVMs used in the elections are kept. Talking to reporters, the candidate, D Arvind, said he had some apprehensions on the security of the Electronic Voting Machines in strongrooms. In a representation to District Collector and Returning officer Nizamabad, M Ram Mohan Rao, Arvind requested the official to allow him to put his own lock on the strong rooms in which EVMs and VVPATs used during the elections have been stored. "... allow me to put my lock also to the strong room in which EVMs and VVPATs used during General Elections to the House of the people (Lok Sabha) 2019 are stored," Arvind said. Lok Sabha Elections 2019: TRS Polling Agent Arrested For Taking Photograph Inside EVM Strongroom in Malkajgiri Constituency. He marked a copy of the letter to the Chief Electoral officer Telangana, Rajat Kumar, and the Election Commission of India. A senior official involved in the recent polls said the strong rooms in which the EVMs are stored are kept under "three layer security cover." As many as 185 candidates, including 178 farmers demanding remunerative price for turmeric and red sorghum and setting up of a Turmeric Board, were contesting from Nizamabad, from where Telangana Chief Minister K Chandrasekhar Rao's daughter Kavitha is seeking re-election.